In this article, we will discuss the stochastic indicator and how best to use it, but also when not to use it. Created by George C. Lane in the late 1950’s this gained popular appeal through its ability to visibly show if a stock is overbought or oversold. Stochastics is an oscillating indicator which means it oscillates between the 0 and 100 marks. Stock is Oversold: the line is below the 20 mark – a stock price is oversold and may be due for an upturn in its price movement. There are 2 main types of setting, the Fast Stochastic and the Slow Stochastic. Slow Stochastics: use longer time periods and longer average periods – this creates a smoother flow and gives the ability to see trends clearer, the drawback is the Indicator lags price and is less responsive. Please be careful with this indicator the following points must be understood when using stochastic indicators. In my opinion, Stochastics work well on a short time frame to save you a few points on your buy and sell price but not much more. Stochastics work best when there are no strong fluctuations or volatility in the market or in the particular stock. Always use Stochastics with other indicators not alone. Stochastics use the Price Open, High, Low and Close for the period, so can be used well in conjunction with the Relative Strength Indicator (RSI), which uses only Close Price as the input. Backtest a stochastic setting to see if it fits the past. Adjust the Values to fit the stock. If it does not tell you anything, do not use it. In this example from, you can see Smith & Wesson Holdings Corp, the gun maker. 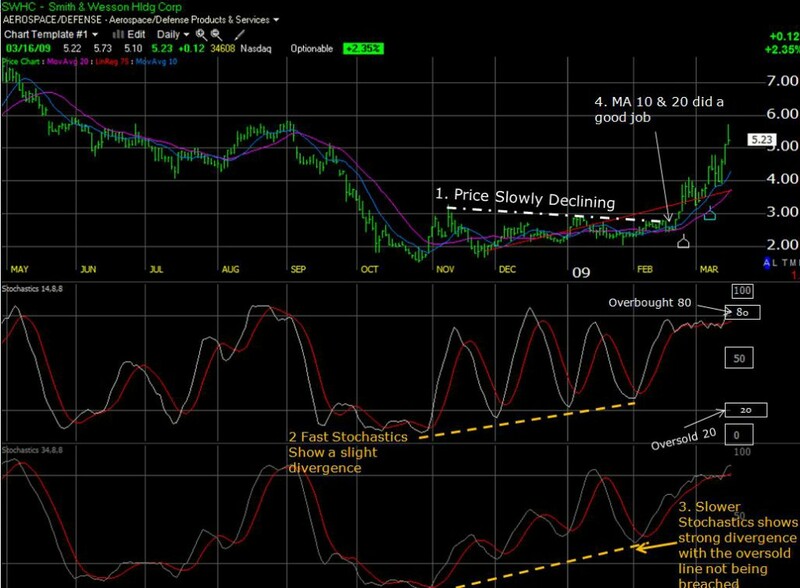 Point 3: Slow Stochastics (34, 8, and 8) shows much smoother lines and stronger divergence where the stock for this whole period does not reach an oversold state. Point 4: Moving Averages (10 & 20) did a really good job indicating when the ideal time to buy was. Thus using Stochastics with other indicators is important. If you like to use Stochastics, use them with care. Follow the guidelines above and use with other indicators. Divergences are your friends with practically all indicators. Remember when an indicator starts to Diverge with the Trend of the price, then this is an early warning signal that the underlying factors behind a stock price are changing and it may not be visible in the price pattern.